After a lot of fanfare and a little delay it appears the AppleTV is finally making its way out the door. The AppleTV is just the latest in a long series of devices seeking to vie for the long-coveted role of the ultimate 'convergence' device - a machine that combines the capabilities of a computer with a customized interface designed to be used in the living room environment. With broadband access and wireless networks rapidly becoming the norm this long-awaited dream is finally seeing the first stages of fruition. If you're already heavily-leveraged into the Itunes world, the AppleTV would seem a logical extension. It's basically an Ipod for all your Itunes content on your TV. However there are plenty of other devices that have long-since offered this type of functionality as well. The D-Link MediaLounge (and a myriad of other devices like it) has been available for years and offers much of the same functionality. The Xbox360 similarly ties into Windows Media Center PCs and can also download or stream videos and movies (plus play games to boot.) Even my humble Nintendo Wii has offered an unexpected amount of HTPC-like functionality thanks to its web access to media sites like Finetune and Orb which are designed for the Wii browser. But all of these solutions still fall short in some form or fashion to a full-fledged HTPC. 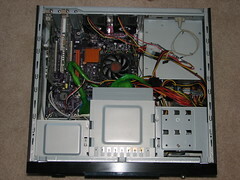 I've been tinkering with HTPC software on some of my systems for several years now. Unfortunately, I don't have a copy of the most popular software (Windows Media Center) but I have tried various other free and paid options out there - for Windows: Snapstream, SageTV, and Meedio; for Linux - MythTV and LinuxMCE. However, my favorite alternative I've used thus far is actually a Windows-based freeware solution called GBPVR. It fit my needs nicely as it runs on Windows 2000 (the only spare non-Linux OS I have available) and works seamlessly with my Hauppauge TV tuner cards and remote. I've been happily running GBPVR for almost two years now, however I've never really had a proper HTPC case for the main system I use in the living room. I've always just kept the ugly spare case hidden behind our armoire. However, I finally broke down and bought a new case for the system a couple weeks ago. You can see some of the pictures of the new system and all the fun I had during the upgrade on my Flickr. The good news is that I can now finally take my HTPC out from the shadows and into the light as the new case blends in perfectly with the rest of our home theater equipment. The nicest thing about an HTPC is that it's imminently configurable and (unless you're going to do heavy gaming or encoding on it) it doesn't have to have the most expensive hardware. My GBPVR system runs on a modest AMD Sempron 3100 with 1GB of RAM and an old ATI Radeon 7200 (I only need S-video out as I don't have HDTV yet.) I only have an old 20GB hard drive in the case as I record and store most of my content on my main system in my basement that stays on 24/7. I could transfer the files wirelessly, but I have ethernet already wired so that's even better in terms of speed/stability. I realize most people just don't like to tinker at this level though. For them, turnkey solutions like the AppleTV and similar devices make the most sense. I'm very curious to see what the next generation of the Xbox will be like. The current Xbox already offers a lot of HTPC functionality if you have a Windows Media Center PC. Throw in some Media Center-like DVR capabilities out of the box (there's some mods for this already) and it could be a fantastic all-around entertainment device.